Whether you’re a regular reader, or just pop in occasionally, it’s not always easy to keep up with our Wikinomics blog content. With this in mind, we have created the Wikinomics Roundup: Week in Review, to try and capture in brief, some of the thoughts, discoveries, and discussions that graced the blog from the past week. We have attempted to condense the key content to just a few paragraphs, but to understand the idea in its full context, you’ll have to visit the original post. Please also keep in mind that not all blog posts are conducive to being summarized in this way, and what follows is but a fraction of our week’s content. With that out of the way, read on! While collaborating with artists for short-term promotional pieces is nothing new, a number of companies are taking their relationship with artists to the next level, and early signs point to a winning relationship for both sides involved. Dupri is very pleased with the budget provided by P&G, claiming “You can’t get this type of marketing budget. There are endorsement deals, but not like this.” Artists appear to benefit by receiving both an up-front payment as well a royalty agreement that outpaces what is offered by the big labels. Andrew Jones of the Tall Skinny Kiwi talks about how the Wikinomics ideas of transparency, generosity, and trust relates to the Bible and Christian ideals. The State Sunshine and Open Records blog criticizes “Show us a Better Way”, a new website sponsored by the British Government, but reconsiders the statement after hearing this site is the brainchild of the U.K.’s Minister for the Cabinet Office. The website invites users/citizens to post ideas for new government services. Wikinomics and how mass collaboration will fundamentally change learning was one of the topics at the recent NECC 2008 conference. Brendan Dunphy’s Innovation Blog debates the Wikinomics Report Card on General Motors. He argues that closed innovation is better when the current market solution is not sufficient. Paula Thornton of the Fast Forward Blog talks about Don Tapscott’s economic tsunami in reference to the User Revolution and the Age of Aquarius. Derek: Dipity was started by three friends who got together and who were long time Internet professionals, one from development, one from design, and the other from a product user and consumer perspective. We were all struggling with the same problem – the tools available that tell stories and provide backgrounds around particular topics are lacking because the web is so media rich now. If you look at the way people use information or when people write stories, they use text and don’t really integrate photos or videos and images. We thought of a better way to create an interactive experience around topics that takes advantage of the web, people in the world, and the fact that everything is connected. Dipity allows you to easily create interactive experiences around particular topics; could be people, could be places, could be subjects like Darfur, and aggregate information in one place. This creates an easy summarization of a topic that’s easy to understand and a richer experience. A corporation too, is rather like Dennett’s sea squirt. When young and growing, it is all innovation-everywhere – strategy is an active line function, a brain, through early twists and turns towards fertile markets. Research isn’t a separate function because it is all research. As it matures, the organization may take root in a comfortable market… and eat its own brain. Strategy shrinks and becomes a backroom staff function, and R&D is first localized as a vanity function (“we have a lab with 50 star PhDs!”), and then gradually shrunk. Then one day, the market is threatened and everybody screams, “Who moved my cheese!” The capacity for active strategic steering and innovation everywhere has been lost. If you think this utopian vision is too far-fetched, consider solutions like Jwaala.com. The company is taking some early steps towards enabling this type of functionality at banks with products like personal money manager, budgeting and reporting tools, account aggregation, and dashboards and widgets. My hypothesis is that the reddit team doesn’t have to worry about knockoffs stealing their lunch because it would take a few years and many, many users for the weighting variables in the clone sites to become anywhere near as refined and useful as in the original. Giving away their source code is really giving away very little. In exchange, they get all of the accolades of openness that come with bearing all to the world, and legions of users who then want to engage in making the site even better — for free of course! But what’s really important about the wiki is not just that one example of the expense report, or even that the report itself is available on the wiki. It’s the idea that employees are working together to put the information they’re carrying around in their heads on the wiki, where others can more easily access it, use it, edit it, and improve it. That builds a culture where all employees can become contributors – both to the goals of the organization, and the evolving knowledge about how to reach those goals. FreeGovernment.org, launched on July 4, is one of a growing number of online, direct democracy communities that allow users to vote on bills, draft their own legislation, and engage in debate. While these communities present an opportunity to make government more accessible and responsive to citizens, they have failed to earn any influence over politicians. To change that, Free Government plans on electing the politicians. The community, which is also a political party, is looking for candidates to run in the 2008 US Congressional election. If elected, these politicians will be contractually obligated to vote according to the results of an online poll of constituents (for their vote to count, users will have to first be confirmed as registered voters). “What’s in it for Yahoo! and partners? : Why would Yahoo! open up its search infrastructure and technology to developers, entrepreneurs and companies who could use it to compete with us? It’s really quite simple. First, we believe that being open is core to Yahoo!’s future success — opening our network, opening our own search experience via SearchMonkey, and now opening our search infrastructure via BOSS — will lead to innovation both on Yahoo! and powered by Yahoo!. Being Open: Traditionally, De Beers has been very closed in their dealings. Throughout their history, they have tried their best to control industry supply, and keep competition down. In 1994, along with GE, they were charged with price fixing on industrial diamonds. In 2006, De Beers settled numerous class action lawsuits alleging that they were keeping the price of diamonds artificially high and violating anti-trust laws. They agreed to pay out almost $300 million to anyone who bought diamonds from a jewelry store from 1994 – 2006. However, ever since Gareth Penny became CEO and the complete change in business strategy, the company has become more open and transparent. Now, 100% of their diamonds are sold through the Kimberly Process which ensures that diamonds are conflict free. For the second consecutive year, they released a massive “Report to Society”. The Report covers De Beers approach, economics, ethics, employees, communities, environment, and a range of case studies, initiatives and related web sites. However, it was reviewed by Ethical Corporation magazine as “transparent but not entirely reader friendly. You can find the 2007 report here. And there you have it – The Wikinomics Roundup: Week in Review. 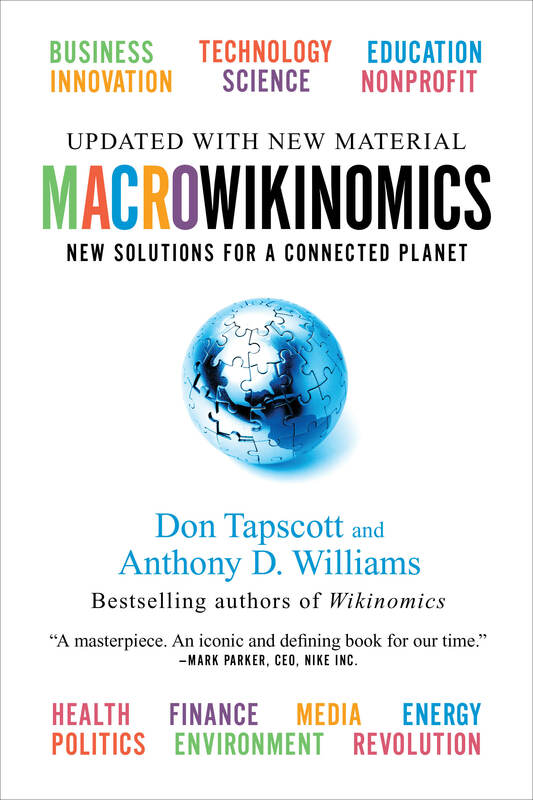 Keep checking back each week, as Wikinomics bloggers keeps their eyes on the web, and their fingers on the keyboard. And as always…if something stood out and interested you, please comment!